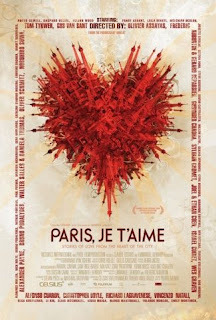 An hour plus in I was tempted to summarize the film like any dutiful movie reviewer - something to the effect of "Paris Je T'Aime" is like wishing for a thunderous downpour and receiving a light dollop of rain on the brim of your beret. But by the time it ended I was more tempted to write something along the lines of, say, "Paris Je T'Aime" is a three course meal that assuages your appetite for two courses, nothing more, before serving up a flourless chocolate mousse for dessert that makes the two courses prior to it a distant memory. I found most of the shorts in the early-going to be slight, if unharming. They started, they ended, I nodded, and readied for the next one without any thought of the one that just happened. The only exception being The Coen Brothers gem offering up a confused tourist (Steve Buscemi, in a performance worthy of the silent movie greats - he never speaks) who inadvertantly makes eye contact with the wrong people. To be completely honest, I didn't even watch the one with the mimes. I skipped right over it. Why? I hate mimes. No, no, no, I hate mimes. Uh oh. The next one (and last one) just so happens to star Margo Martindale. We've been over her. She was the mother of Maggie Fitzgerald in "Million Dollar Baby". Therefore I'm pre-disposed to hate her to the extreme despite the fact she's never done anything to me and is probably a very nice person in real life. But I don't care. I pick up my scotch glass. But then I set it back down. Why? It's marvelous. She's a postal carrier from Denver on a solo vacation to ole Parie and she wanders about the city, fanny pack firmly attached to the waste, and she offers up a running voice-over in stilted French about who she is and how she feels and why she's taken this trip. I'm an advocate of the solo vacation. I've taken two myself. But, yes, there are times when you wish during those singular excursions that you had someone with you. So allow me to offer an apology to Ms. Martindale without being too apologetic. She's kinda like the Ben Gazzara/Gena Rowlands couple from the preceding short. I kinda like her now, even though I still don't.